The pancreas is an organ of the digestive system located deep in the upper part of the abdomen, behind the stomach and in front of the spine. It is only about 2 inches wide and 6 to 8 inches long and sits horizontally across the abdomen. 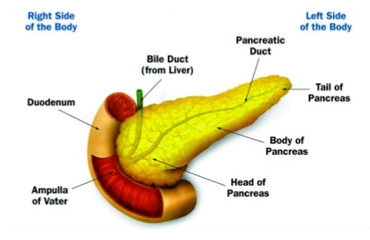 The pancreas is composed of three parts. The endocrine glandular tissue of the pancreas produces hormones and releases them into the bloodstream. The hormones are made in collections of cells called the Islets of Langerhans, which are found in small clusters throughout the pancreas. Insulinis an important hormone made in these cells and helps control blood sugar levels. The word cancer is used to describe any one of a group of diseases in which the cells are abnormal, grow out of control, and can spread. These abnormal cells are different from normal cells in both appearance and function. Pancreatic cancer occurs when abnormal cells grow out of control in the tissue of the pancreas and form a tumor. Because the pancreas lies deep in the abdomen, a doctor performing an examination on a patient would not be able to feel a pancreatic tumor. Pancreatic cancer has no early warning signs, and there are no effective screening tests. As a result, pancreatic cancer rarely is discovered early. Many times the diagnosis is not made until the cancer has spread to other areas of the body. In the United States, pancreatic cancer is the fourth leading cause of cancer deaths in both men and women. 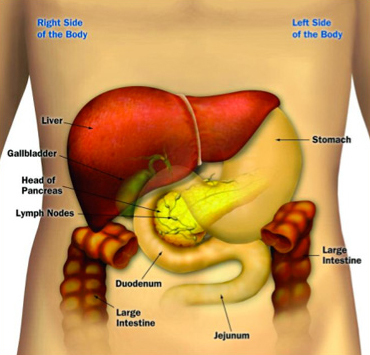 In2007, about 37,000 patients will be diagnosed with pancreatic cancer. Almost all patients with pancreatic cancer are older than 55 years (90 percent), and more than 70 percent are older than 65 years. Unfortunately, pancreatic cancer can also occur in younger people, especially those who have a family history of the disease. Today, better diagnostic tests and newer treatments are beginning to change these statistics and provide a moreoptimistic future for patients diagnosed with pancreatic cancer. The most common types of pancreatic cancers areexocrine tumors called ductal adenocarcinomas, which are thought to form in the pancreatic ducts. About two thirds of all pancreatic cancers form in the head of the pancreas. The other third form in the body and tail.3These tumors are malignant, meaning they can invade nearbytissues and organs. Cancerous cells can also spread through the blood and lymphatic systemto other parts of the body. When this occurs, it is called metastaticcancer and it may be life-threatening. Tumors can also form in the endocrine cells of the pancreas. These types of rare tumors are called islet cell tumors or pancreatic endocrine neoplasms, and most often they are benign.Those that are malignant are called islet cell cancers or malignant pancreatic endocrine neoplasms. Other rare forms of pancreatic cancer are listed in Box 1-1. It is important to distinguish between exocrine and endocrine tumors because each has different signs and symptoms, are diagnosed using different tests, have different treatments, and have different prognoses. This handbook does not focus on endocrine tumors or other rare tumors of the pancreas and related organs. However, most National Cancer Institute–Designated Comprehensive Cancer Centers have experts who can help patients who have these rare pancreatic tumors. Until recently, little was known about pancreatic cancer. Because of new discoveries in all types of cancer, more research is being focused on pancreatic cancer. Scientists are beginning to understand the genetic basis of this disease. (See Section 2 on Causes. )This knowledge may help in understanding its causes and in determining who is most at risk.Eventually, new and better ways to treat pancreatic cancer will be discovered. Pancreatic intraepithelial neoplasia (PanIN) are lesions too small to see with the naked eye. Like IPMNs, PanIN lesions can also progress to invasive pancreatic cancer over time.